The tomato hornworm is a voracious tomato pest, capable of reducing tomato plants to leaf blades and stalks overnight. Tomato worm infestations start slowly, with a few leaves reduced to midribs, but can end with defoliated plants as the tomato worms—and their appetites—grow. 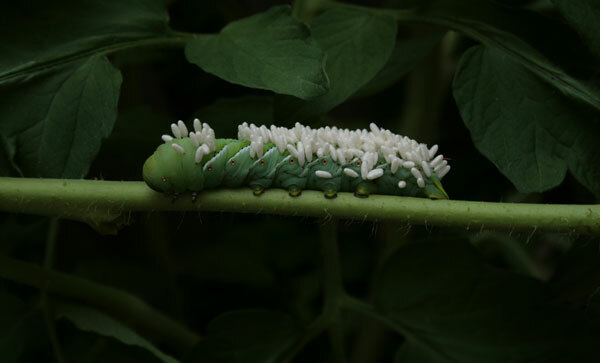 The first sign of tomato worm infestation is often a few skeletal leaves low on the plant, with telltale green barrel-shaped droppings on the leaves or ground below. If you don’t see droppings, the damage could be done by deer, but with deer-munched tomato plants, the ends of the leaves, including the midribs, are bitten off, and it often looks like someone took a hedge trimmer to one side of the plant. You’ll probably also see tomatoes with a single bite taken out lying on the ground around the plants. Tomato worms just eat the leaves, and the stiff midribs remain. Tomato worms are well-camoflaged, and can be hard to spot in the dense foliage of overgrown tomato plants, especially when the worms are small. They’re easier to see when you prune your tomatoes and train them up a stake, Italian-Grandfather-style, but they can also do a lot more damage on plants with fewer leaves to spare. Prevention is the best cure, so keep weedy relatives of tomatoes–nightshades like jimson weed, deadly nightshade, and other plants–away from your garden. Tomato hornworms feed on these alternate hosts, but move to tomatoes quickly once they're growing nearby. Fall cleanup is always an important preventive measure for any pest or disease problems, because pests and diseases overwinter in plant debris left on the field. At the end of the season, remove all tomato vine, eggplant, and pepper plant debris from the garden to the compost pile, then lightly till the soil to expose any pupating hornworms in the soil. Pupae are large, brown, and shiny. If you have chickens, turn them loose on the plot after you've turned the soil, and they'll find and eat any pupae. The adult hornworm moth is large, and they're strong flyers, capable of covering a long distance, so local preventive measures, while helpful, may not prevent a new infestation. Other tomato worm controls include hand picking, soap sprays, and attracting parasitoid wasps. For the home gardener, hand picking is the best way to control a tomato hornworm infestation. At the first sign of damage, put some soapy water in a container, and head for the garden. Tomato worms can be large—1/2” (1 cm) thick and 4” (10 cm) or more long. Though they may look formidable, they can’t bite or sting you, and the “horn” on their tail is all show. 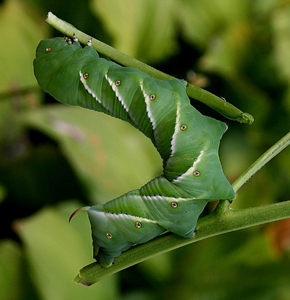 Wherever you see damage, look for the thick caterpillars on the undersides of leaves, munching away. They like to cling to the underside of a branch, so their body looks like part of the stem. Pull them off the leaves and drop them into the soapy water. Once they’re dead, you can compost them. If you don’t see any on the most damaged leaves, look on nearby leaves, where they’ve moved for their next meal. Young hornworm larvae can be controlled with soap sprays. You can mix a simple soap spray in a quart spray bottle. Just fill it halfway with warm water, add 1 tsp vegetable oil, and 1/2 tsp dish soap. Cap, shake to mix, then fill the bottle to the top with water. Spray the plants thoroughly, especially the undersides of the leaves. Soap sprays cover the breathing pores of the hornworms and suffocate them, but they have to cover the insect completely, or they won't work. If you see a tomato worm with white cocoons on it, like the one in the photos above and at right, leave it in the garden! The cocoons are Braconid wasps pupating on the outside of the worm. Braconid wasps are small (1/4”—1/2 cm) wasps that lay their eggs inside tomato worms and other caterpillars. 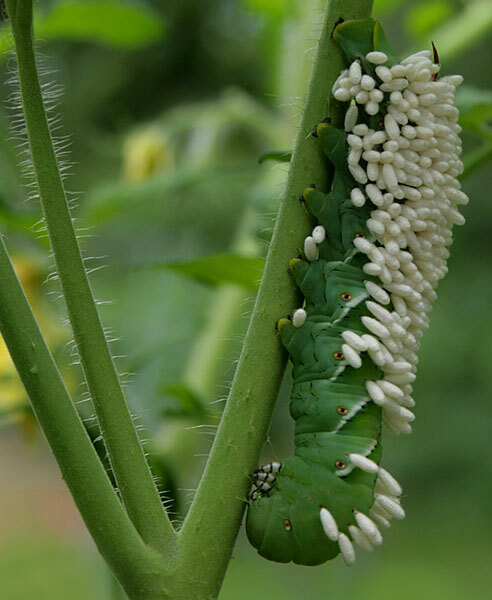 They inject polydnaviruses with their eggs, to immobilize the tomato hornworm’s immune system, so the larvae can feed undetected. The larvae eat nonessential organs first, then dine on the essential organs before burrowing out and spinning cocoons outside the caterpillar. Tomato worms at this stage of infection stop eating. They’ve done all the damage they can to your plants already, now they’re your friends. Follow the link for more information on parasitic wasps like Braconid wasps. Also see Attracting Beneficial Insects for ways to attract and build up populations of beneficial insects in your garden.